Rumours are flying that HP is to unveil a touchscreen laptop by the end of 2008. 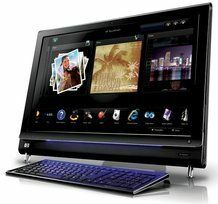 The company has already used touchscreen technology in its range of TouchSmart PCs and, according to the Wall Street Journal, it is to utilise this tech in a new laptop range. This is not the first time that HP has launched a touchscreen portable computer but there will be more of a marketing push this time around, and new software means that the screens will work without the use of a special pen. The touch-sensitive screens will allow users to control the mouse pointer with their fingers, surf the web and do most things you usually do with a keyboard and trackpad. HP is also to launch a netbook this year with a 10-inch screen, according to the paper. This is to cash-in on the huge growth that this sector of the PC market has seen.